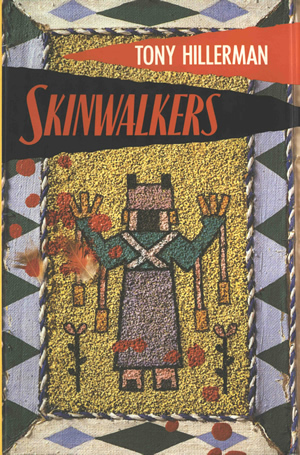 This is the first UK edition of Tony Hillerman's eighth novel, Skinwalkers, which was published in 1988 by Michael Joseph LTD in London, England. This is a hardcover book with dust jacket. The cover was illustrated by Neil Breedon. This cover mimics the Sphere Books Ltd covers and follows the same format: a multimedia collage, over a rough canvas base, that incorporates folk art elements and and items that indicate plot elements. In this case, there is a sandpainting featuring a yei figure flanked by flowers. These elements are framed by blue and white coarse string embroidery, with a secondary framing device of a green, blue, and white colored geometric diamond pattern. A smattering of blood and feathers, neither of which manifest in the novel, provide the finishing touches. On the back, on a goldenrod background, a drawing of the figure from the front cover sits atop a quote from Jonathan Kellerman. Three other quotes are below, and the bar code is at the bottom right corner. The jacket contains both front and back fold-outs. The front fold-out contains a brief synopsis of the novel and the back fold-out contains a brief biography of Tony Hillerman. Binding: Full bound red cloth boards. Author name, book title, and publisher's imprint in gold on spine.